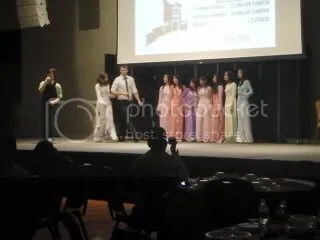 USF’s Vietnamese Student Association held it’s annual event to display some Asian pride while also celebrating the mid-Autumn Moon Festival. 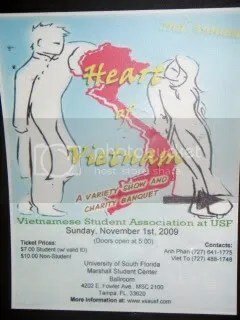 Guests at the “Heart of Vietnam” banquet were treated to a fashion show, humorous plays, and table-side food service. I was privileged to promote AKO during the event. I was continually entertained by the various acts on the stage while the food that was served was decent– simple and not too flavorful. I mostly wished that the large USF ballroom was more filled with guests. Compared to the heavily advertised Journey to the East celebration just a month before, less than half of the tables were filled with guests. As a result, I barely sold any AKO products eventhough I had decided that a part of my profits would go towards helping Gawad Kalinga— an organization working to end the poverty found in Southeast Asia. On the other hand, I had a great conversation with a t-shirt designer who was visiting from California. I really hope he can help me out. Click on my pictures to be transported to the Heart of Vietnam.